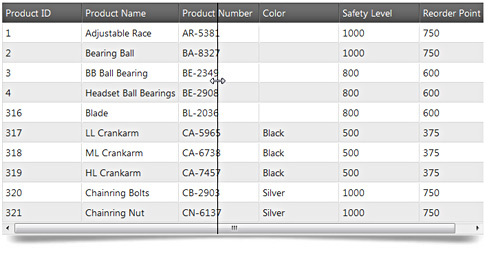 Both the igGrid and igHierarchicalGrid controls feature the ability to resize columns. Users can choose to arbitrarily adjust the width of a column or double-click the right border of the column to expand it to the width of the longest string in the column. Further information regarding the classes, options, events, methods and themes of this API are available under the associated tabs above. Resize the column to the size of the longest currently visible cell value. A list of column settings that specifies resizing options on a per column basis. Enables disables resizing for the column. Maximum column width in pixels. Minimum column width in pixels. Specifies whether the resizing should be deferred until the user finishes resizing or applied immediately. The width in pixels of the resizing handle which is position at the right side of each resizeable column header. The handler function takes arguments evt and ui. Use ui.owner to get the reference to the igGridResizing widget. Use ui.owner.grid to get the reference to the igGrid widget. Use ui.columnIndex to get the resized column index. Use ui.columnKey to get the resized column key. Use ui.originalWidth to get the original column width. Use ui.newWidth to get the final column width after resizing. Event fired before a resizing operation is executed. Use ui.desiredWidth to get the desired width(before min/max coercion) for the resized column. Resizes a column to a specified with in pixels or auto if no width is specified. An identifier for the column. If a number is provided it will be used as a columnIndex else if a strings is provided it will be used as a columnKey. Width of the column in pixels. If no width is specified the column will be autofitted to the width of the data in it. Class applied to the resize line that is visible during resizing. Class applied to the resizing handle. Class applied to the resizing handle and the body to change the cursor.